The Volvo FM uses clever ideas to keep your drivers happy. Like fingertip steering to lift tonnes of weight from tired shoulders. Or the new remote control, which makes loading and unloading much easier. Your finance department will have something to smile about, too. When it helps your business become greener and more fuel-efficient. And when the factory customises it to save you even more time and money. The Volvo torque curve. You'll feel it in the pedal. Excellent torque at low revs. An extremely wide max torque range. Peak torque meets peak power. 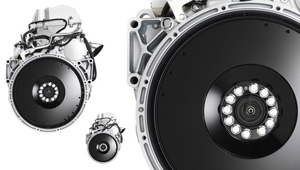 Volvo's leadership in diesel-engine technology is clearly visible once you start comparing engine curves. You'll experience fast acceleration, excellent pulling power, comfortable low-speed handling and, not least, a fuel-efficient and pleasurable ride at cruising speed. Choose from over 850 colours. All green. Save time and money by not having to visit a separate paintshop - just have your Volvo cab delivered in the colour you like. 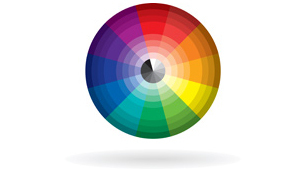 Choose from over 850 different hues, tints, and shades. And if you don't find the one you're looking for, we can virtually mix any colour for you. What's more, the cabs are painted in the world's most modern and environmentally optimised paintshop. A comfortable driver is a good driver. That's why every part of the new Volvo FM interior has been developed with the driver in mind. From the entry step to the bunk. Enjoy a perfect driving position and all the modern amenities you could ask for, for a true car-like driving experience. 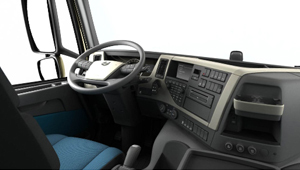 Volvo Dynamic Steering. Total control without strain. Perfect stability at high speeds. Total control at low speeds. And drastically reduced strain on your muscles. 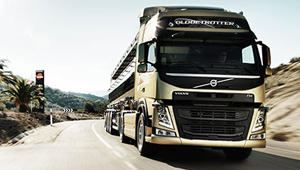 The groundbreaking Volvo Dynamic Steering will completely change the way you drive. Without effort, your Volvo FM simply follows your intentions.